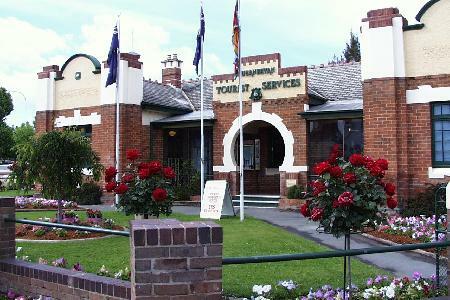 The city of Queanbeyan is actually located in New South Wales, but is conveniently positioned right on the border with the ACT so the Canberra city centre and all of the major tourist attractions in the ACT like the Parliament House, National Gallery, National Museum, National Portrait Gallery, National Zoo & Aquarium are only a short 10 minute drive away. The city of Queanbeyan is also a great accommodation base from which to explore the New South Wales snow fields, Kosciuszko National Park and the NSW south coast, which are all just 2 hours drive away. Queanbeyan is positioned along the banks of the Queanbeyan River which joins with the Molonglo River to form Lake Burley Griffin and the city is also just 5 minutes drive away from the Canberra International Airport. Business and leisure travellers who are wanting to stay in the ACT on a budget will find that Queanbeyan is the ideal place to stay because it features an array of quality hotels and fully self contained apartments that have accommodation to suit any budget. Throughout the city centre of Queanbeyan you will find a vast array of fine dining restaurants, cheap eating establishments, cafes, shops, bars and attractions to keep you busy throughout your stay. The Parkway Motel is centrally positioned in the city of Queanbeyan and is only a short walk from shops, restaurants, the post office, clubs and pubs. This Queanbeyan motel specializes in catering for a large groups, as well as individual travellers, couples and families. One of the great things about staying at the Parkway Motel in Queanbeyan is that you get very affordable accommodation and still all of the many attractions of Canberra are within a 10 to 15 minutes drive. With comfortable and affordable hotel rooms as well as studio, 1 & 2 bedroom apartments. all of which have been recently refurbished, the Best Western Central Motel & Apartments in Queanbeyan is a great place to stay if you are on a budget. Another good reason to stay at the Best Western Central Motel & Apartments is that you will be placing yourself only a few minutes walk from the Town Centre which is home to a variety of restaurants, cafes, shops and even a local supermarket. Also the Canberra International Airport and the Canberra city centre and all it has to offer are just a short drive away. Located right in the heart of the Queanbeyan city centre between Crawford, Campbell and Antill Streets is the Queanbeyan Aquatic Centre, which is popular summer attraction with people of all ages. The aquatic centre features a large olympic size swimming pool, a 25 metre indoor swimming pool, a toddler's pool, free BBQ facilities, large grassed areas for relaxing and even a kiosk for snacks and refreshments. One of the more popular things to do whilst staying in Queanbeyan is to go white water rafting on the nearby Queanbeyan River. There are companies that take regular tours of adventurous travellers to the river and will help you to not only keep safe but also to find the best places to go rafting along the river. The Queanbeyan Museum is situated on the corner of Lowe Street and the Kings Highway and is a unqiue and convenience place for people staying in this city to visit. At the museum there are a fascinating collection artworks, historical artefacts and information about this special part of Australia. Whilst staying in Queanbeyan you should take the leisurely drive along Captains Flat Road to explore the marvels of the Yesteryear Museum, which is situated in the rural township of Captains Flat. This museum has an extensive collection of old artefacts that will take you back in time to the beginning of settlement in Australia. Another popular thing to do for people staying in Queanbeyan is to take the short drive up the Queanbeyan River to the Googong Dam and spend a relaxing day on the foreshore of the dam. Here you will find tranquil picnic grounds, unique bushlands surrounds and an array of bushwalking trails. For people staying in Queanbeyan the main shopping precinct is situated around the streets of Kings Highway (Monaro Street), Crawfrod Street, Morisset Street and Antill Street. Around here you will find a large variety of different shops, factory outlets, megastores, restaurants and cafes. The major shopping centre in Queanbeyan is the Riverside Plaza Shopping Complex which is positioned on the corner of Kings Highway and Collett Street. In this shopping mall you will find a vast array of designer fashion boutiques, jewellers, supermarkets, variety stores, electrical outlets, food courts and many major department stores. Right in the heart of the Queanbeyan city centre between Lowe Street and Campbell Street is the Queanbeyan Oval, which is a suburban football and cricket ground that holds regular matches of all standards throughout the course of the year. Just a short 10 minute drive away from Queanbeyan is the Fyshwick Business District. In this large business and commercial shopping precinct there are a large selection of electrical department stores, automotive stores, shopping malls, clothing shops, factory outlets and hardware stores. If you are interested in keeping fit or enjoy bushwalking then just a short distance from Queanbeyan you will find numerous places with great walking trails and lookouts with spectacular views. These areas include the Bicentennial Park, Jerrabomberra Lookout, Lowden Forest Park, Queanbeyan Park and Queen Elizabeth Park.